With so many top developers of online slots, the range of games available to players grows at a rapid pace. Exciting new games are released on an almost daily basis, with plenty of different styles designed to cater to every taste. The last few days have been no exception and there have been some exciting releases for players to enjoy. Whether you are looking for a bit of retro action, a trip to the jungle, a journey through South America, or anything else, there are sure to be new releases that you will enjoy. Here are reviews of three of the latest games to go live, read all about them below and then head over to your favourite casino and start playing straight away. If you are of a certain age then you will no doubt have fond memories of playing highly pixelated early computer games. 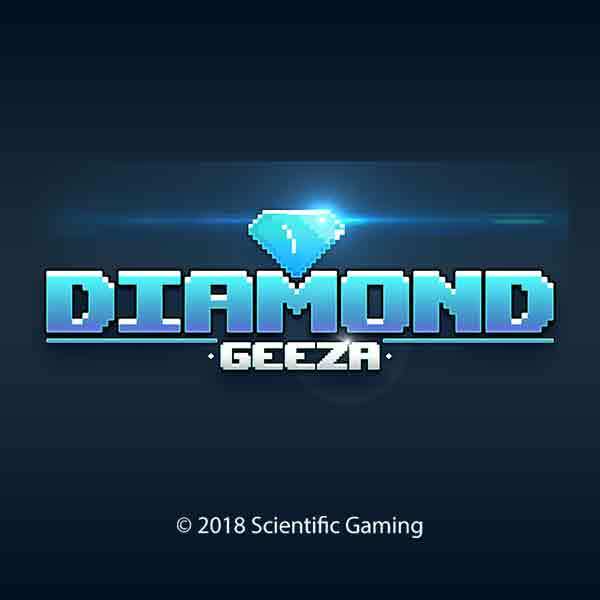 The new slot Diamond Geeza from Inspired Gaming is a throwback to those days and it is giving you the chance to win some huge payouts. 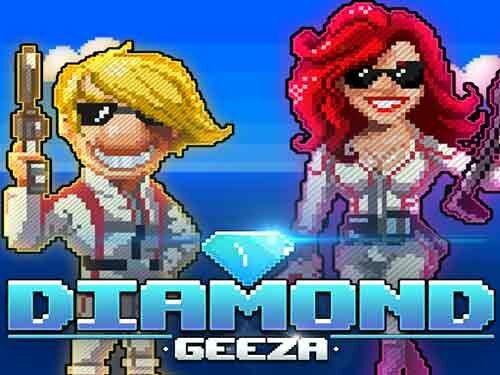 Diamond Geeza is a 5 reel slot with 3 rows and 243 ways to win, which means that you simply need to land matching symbols from left to right across the reels without worrying about paylines to win payouts. The reels are set on some kind of submersible structure that is floating on the ocean with an island visible in the background. The high value symbols are linked to the theme and include the game’s logo, the Diamond Geeza himself, a red-haired woman, a sports car and a speedboat. The lower value symbols are six disks engraved with 9, 10, J, Q, K and A. There is a large red ‘W’ wild symbol, it will substitute for all of the other symbols, except for the diamond and bonus symbols, to help and form winning combinations. The bonus symbol is some kind of metal case. The slot’s Fever Mode begins when you land two of the bonus symbols anywhere on reels three and four. It will multiply your next win by either 5x or 10x. If you land the bonus symbol on reels three, four and five simultaneously then the free spins begin. The free spins take place on a set of reels with multiplier meters either side of them. Every time a big blue diamond symbol lands on the reels it will increase the multiplier value for any wins by 1x and this is shown on the meter. The spins continue until you have collected enough diamonds to reach the top of the meter and hit the ‘End’ marker. The slot also offers Inspired Gaming’s Fortune Bet. This will increase your bet by 50% for each spin, but if you turn it on then the height of the bonus symbol is doubled making it far easier to trigger the feature. Diamond Geeza has a betting range of £0.20 up to £60 per spin so everyone can enjoy it. There is a top payout of 10x your total bet for landing five of the game’s logos along the reels. The Diamond Geeza and the red-haired woman can both payout up to 7.5x your total bet, while the sports car and the speedboat can both payout up to 5x your total bet. The six disk symbols can all payout up to 2.5x your total bet. If you want to enjoy some retro style gaming with the chance of big wins, then head over to your favourite casino and set the reels spinning on this exciting new slot today. If you are a nature fan and you would love to venture into the jungle where you can observe some amazing animals then the new Triple Monkey Slots from High 5 Games might be the perfect choice for you. The game is packed with great features and is sure to provide you with hours of fun. 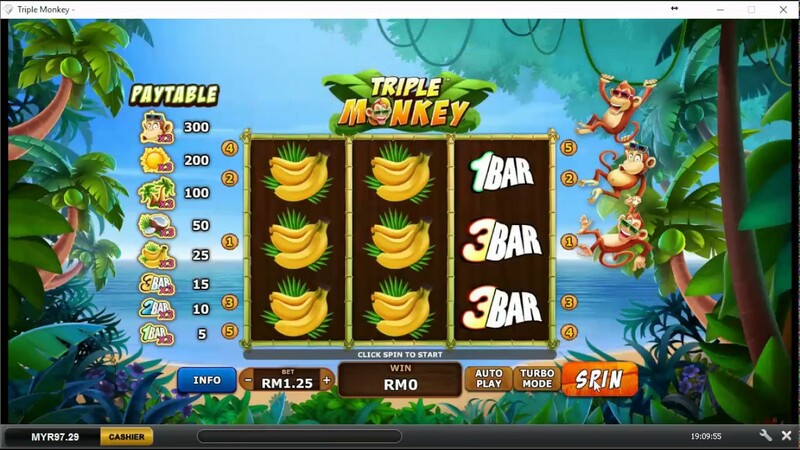 Triple Monkey is a 5 reel slot with variable rows and a massive 720 ways to win. The reels are made of branches that have twisted together and behind them you can see the dense jungle foliage. The high value symbols include the monkey, coconuts and oranges. The lower value symbols are 5, J, Q, K and A. It is possible to land up to three monkey symbols on one reel position and as a result, you can form winning combinations of up to fifteen symbols. The fish is the wild symbol, it can land on reels two through five and it will substitute for all of the other symbols, except for the bonus symbols, to help and form winning combinations. The wild symbol will always be worth three monkeys on one reel position. If you land the Free Games scatter symbols on reels two, three and four simultaneously then you will win six free spins. Best of all, the free spins can be retriggered indefinitely. If you land the ‘Find Your Fortune’ scatter symbol on reels two, three and four simultaneously you trigger a special bonus game. You will first be asked to pick from one of the coloured bananas on display. You then play a picking game with prize values based upon that particular banana. In the game you can win payouts of up to 10000x. The slot also has a special Jackpot feature. If you land three, four or five scatter symbols on the reels you will win payouts of 50x, 500x, or 5000x your total bet respectively. Triple Monkey has a betting range of £0.50 up to £200 per spin. There is a top payout of 2500x available for landing fifteen monkey symbols across the reels. The coconuts can payout up to 120x and the oranges can payout up to 90x. A can payout up to 40x, K and Q can both payout up to 30x, and J and 5 can both payout up to 25x. This is a fun slot that is sure to delight anyone who likes animals. Give it a spin today and see if the monkeys have some big wins waiting for you. If you have ever wanted to go travelling in South America to see the home of the llamas and also the remnants of the Incas, then the brand new Dollar Llama slot from High 5 Games is the perfect game for you. It is packed with great features and could see you land some huge payouts. Dollar Llama is a 6 reel slot with 4 rows and 50 fixed paylines. The reels are set on a structure made from golden bricks and behind them you can see a beautiful view of Inca ruins and mountains in the distance. There are four high value symbols, a llama, a sheep, and two smaller rodent animals. The lower value symbols are 5, 9, J, Q, K and A. There is a golden ‘Wild’ symbol, it will substitute for all of the other symbols, except for the scatter symbol, to help and form winning combinations. The scatter symbol is a golden llama. If you can land three or four of the golden llama scatter symbols anywhere on reels two, three, four or five, then you will win 7 free spins or 15 free spins respectively. During the free spins, landing three or four more scatters will award an extra 7 or 15 free spins respectively up to a maximum of 105. In addition to acting as a regular wild symbol, the wilds can also land on all the reels with a credit value attacked to it. This increases as you move along the reels, for example on the first reel it is worth anything from 25 to 100 credits, while on the fifth reel it can be worth up to 10,000 credits. 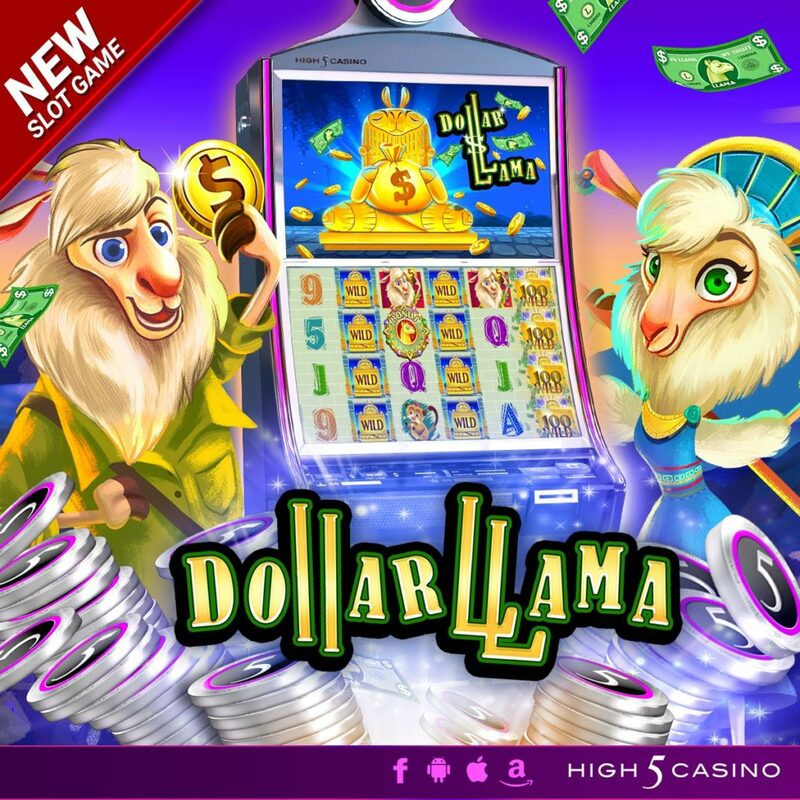 Dollar Llama has a betting range of £1 up to £200 per spin. There is a huge top payout of 2,500x available for landing six wild symbols across the reels. The llama and the sheep can both payout up to 1500x, and the two smaller animals can both payout up to 750x. The A and K can payout up to 200x, and the Q, J, 9 and 5 can all payout up to 150x. If you want to go exploring with animals of South America and see if you can win some huge payouts on the way, set the reels spinning on this fun new slot today.